Bmillions exclusively offers syndicates and combos, instead of the usual solo-play fare that other sites offer. Pooling bets together with other players not only increases your chances of winning, it also gives more you value for your money--especially as Bmillions allows you to continuously play multiple draws. And if you win, they don't charge any commissions and directly credit winnings to your account for most cases. That said, Bmillions isn't perfect and it seems that some users are not completely happy with their service. Are they worth your time or not? Read on to see what makes--or breaks--this lottery site! Combos For More Value: Bmillions gives you more value for your money with lottery syndicates and combos, where you can play multiple lines and bet with other players for more chances of winning, at less the price. The Prize is All Yours: Bmillions does not take any commissions or cuts from your winnings, so you receive your winnings in full. Winnings are Directly Credited: If you win in bet entries or via the official game with amounts less than $600, the full amount will be credited to your account. No need to travel outside your country just to claim your prize (in most cases, anyway)! Serious Security Measures: With banking-grade 256-bit SSL encryption, you can rest assured that all your data is kept private and safe from prying eyes. Lots of Unhappy Users: If you search for user reviews of Bmillions, you’d be surprised at the sheer number of negative comments and feedback regarding their service, especially when it comes to refunds. 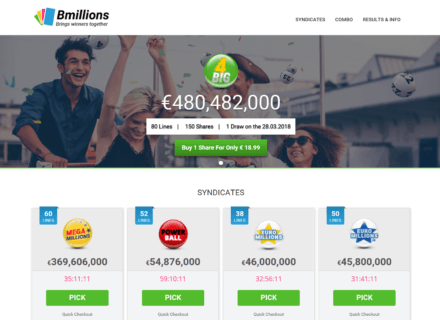 Syndicates and Combo Play Only: Unfortunately, Bmillions does not offer solo draw tickets, nor does it have any extra and quick play games like scratch cards and raffles. Limited Banking Options: Unlike other lottery sites that accept a ton of banking methods, Bmillions only has a handful of deposit and withdrawal options, and some of them are restricted to a specific country. No Live Chat Support: While their email support is available 24/7, a live chat option would have been more than welcome. English and European Languages Only: You won’t find any Asian language from their multi-language options, and they only have 8 languages to choose from. The layout is pretty much comparable to most lottery sites out there. The main menu is located at the top and is quite accessible, while sections showing the latest jackpots and draw dates populate most of the front page. They also offer a short how-to guide and offer up-to-date lottery results. The website is quite organized and devoid of any annoying and/or distracting ads–which makes it a delight to browse. They also have a mobile-optimized website so you can continue to play the lottery even when you’re not in front of a computer. For instance, you can check the latest results on your phone during lunch break at the office. As for language options, you can change the setting from the default English to German, Spanish, Swedish, Čeština, Portuguese, Suomi, and Norsk Bokmål. It’s great for Europeans as well as English-speaking users, but not much for those that speak languages not supported by the site. Case in point: they don’t offer any Asian languages yet. It’s evident that they have a lot of improvements to make before becoming the best. While Bmillions doesn’t offer any single play lotteries, they do offer several lotto syndicates and combos so you get more out of your money. For the uninitiated, a syndicate is when a group of players pool together their bets to get better chances of winning. They offer several lottery games, too, including some of the biggest games worldwide like Mega Millions, Powerball, and EuroMillions. They also offer other internationally recognized lotteries with relatively smaller jackpots like Lotto Sweden, EuroJackpot, Lotto UK, OZ lotto, Lotto Australia 6/49, Australian Powerball, and Thunderball. To give an example, the Powerball syndicate offers 52 lines and 180 available shares. You can choose between 1, 2, or 5 shares and play up to 4 draws. One share for a single draw costs a little over 10 Euros, although the price will vary depending on the game. Bmillions pales in comparison to other lottery sites when in comes to deposit and withdrawal options. With only Visa and MasterCard universally available to all users, other payment options, such as Giropay, Sofort, and bank transfers, depend on the user’s location. This is a huge miss considering some of their competition offers around 40 to 50 banking methods. Bmillions keeps it simple when it comes to crediting prizes. Winnings will be credited directly to your account if you win in betting games, or if you win less than $600 from an official game. If you win the jackpot or a second-tier prize in a betting game, Bmillions requires you to submit a claim form. The amount will be processed and credited to your account within 30 days of submission. Meanwhile, for official game wins worth $600 and above, they will send out the ticket to you so that you may personally claim the prize from the lottery game office. You will have to shoulder the delivery fee for this, as well as any transportation expenses you may need on your trip, but the Bmillions staff will be there to assist you all the way. If you want to know more about their platform, you can check out Bmillions’ FAQ section, where you can find all the must-know details. If you have any other questions, you can contact their support team via email, which is available 24/7. They also have a phone line that you can reach if you want to talk to an agent one-on-one. It’s too bad this is the only support channel they offer, whereas other lottery sites are already offering round the clock live chat support for faster and more efficient solutions. What's the Verdict on Bmillions? Bmillions is clearly not yet at the level of the likes of theLotter or even Lotto Agent, but a few improvements can help them get there. Syndicates and combos gives players the freedom to play as a group and increase their chances of winning, but it may not be an option for those who want to play solo and bag prizes individually. Still, syndicates and combos offer good value, so the trade-off might just be worth it! On the other hand, their banking options and language support could use some improvements. And while their email support is responsive in most cases, a live chat option could have been a great supplement. Then again, if you’re a big fan of syndicate play, then Bmillions is especially designed for you!